← Cheat Codes: Save Your Condiment Containers For A Later Date! There’s this really good local chicken place where we live, aptly called “Chicken Place”. They serve some of the most delicious rotisserie chicken you can imagine. Interestingly enough they specialize in Peruvian cuisine, and I came to learn the reason the chicken tasted so good was because of the style of seasoning they used which takes some cues from other ethnic foods like Chinese and Italian and Indian. After a little bit of research I was able to pinpoint some recipes that captured this awesome flavor, and lo and behold I produced a “close enough” version you can make at home pretty easily. It’s nothing out of this world, but it is certainly just a really delicious, solid way of preparing your chicken when you’re in the mood to grill. In a small bowl, combine the cumin, pepper, chili powder, paprika, sugar, cilantro, ginger, oregano onion powder, and salt. Stir until thoroughly mixed. Arrange chicken on a dish or pan, and sprinkle the spice mixture onto it. Coat well and press the spices into the chicken. Heat either a grill pan, or barbecue grill to medium heat and grease well. Place the chicken pieces onto your grill and cook for approximately 8-10 minutes, or until one side is cooked. Flip the chicken over and repeat grilling on this side as well. 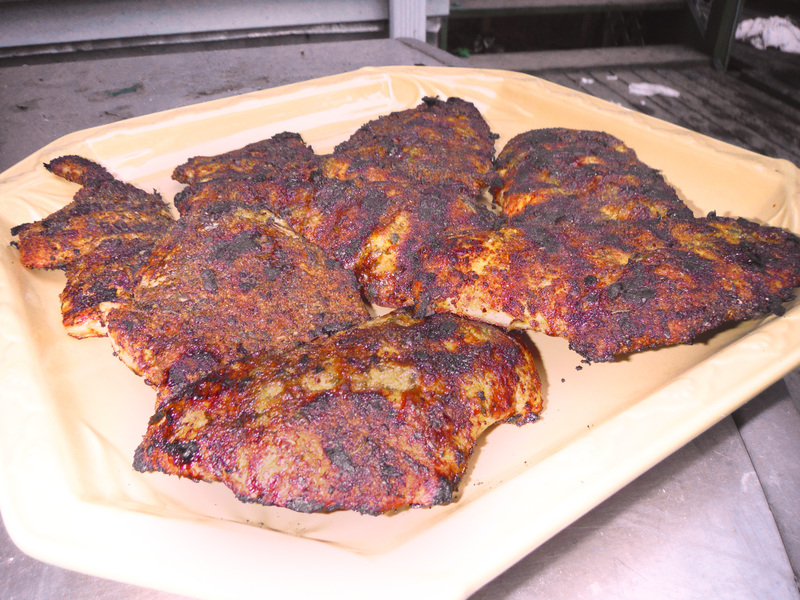 When chicken has developed nice char marks and is thoroughly cooked, remove from grill and place on a serving tray. Squeeze fresh juice from the lime onto the chicken evenly and serve immediately. Posted on September 16, 2015, in Etcetera and tagged chicken, Delicious, easy, gluten-free, grilling, healthy, recipes. Bookmark the permalink. Leave a comment.